This cake was made for a friend’s son who was turning 13. 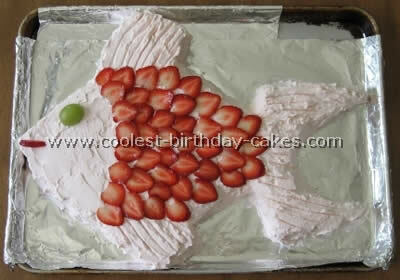 She wanted fish birthday cakes of some sort because he loves to fish but left the design up to me. 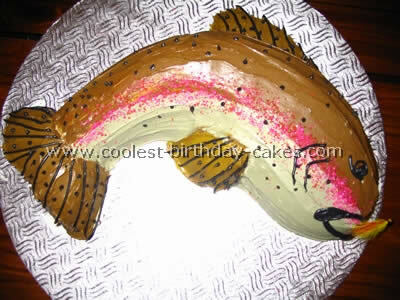 My husband came up with the design of baiting a bass with a birthday cake (and why not?). The cake is simply two 6" rounds cut filled and frosted in the normal fashion with real candles and orange royal icing flames. This cake was cut slightly at the base to allow a "bobbing" feel to the cake and to also allow it a stable ride to the party destination. The bass was made with two 8" rounds which we did not level after baking to add bulk to the body and rice crispy treats for the head and tail. All were frosted with buttercream then covered with white fondant. My husband not only comes up with most unusual designs but also doubles as my airbrush artist when I am crunched for time. He did an amazing job on this guy I think! The scales gills etc. were impressed into the fondant while it was still soft the eye is a "crow" (black licorice piece) with brown frosting applied and the pink gills and lips were painted on with gel paste food coloring. The hook is made of gum paste and painted with silver luster dust and the "Adam" fishing line was white royal icing. The entire cake was then sprayed with a liberal coat of super pearl luster dust mixed with Vodka (it evaporates off quickly) to leave a nice "wet" shine. I made a full sheet cake, trimmed it in the shape of a "goldfish" cracker and iced it with butter cream white frosting. I then tinted fondant with turquoise blue coloring and kneaded it in, rolled it out and covered only the fins, tail and head. I used the back of a knife to add definition to the mouth, tail, fin and dorsal fin. Necco wafers (candy thins) were used for the body of the fish. Starting at the tail work your way up overlapping the Neccos slightly and creating vertical patterns like scales. You can buy edible silver tint to paint some of the Neccos to be exactly like rainbow fish if you’d like. 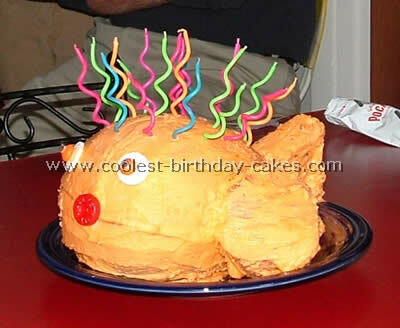 Good luck with making your fish birthday cakes! My son had a backyard beach party with his playgroup friends. We set up a couple of baby pools and threw a dozen beach balls around the yard. I bought little Tropical print bags and filled them with play-Doh goldfish crackers and rubber ducky squirters. I served fresh fruit, macaroni and cheese and whale and dolphin shaped chicken nuggets. 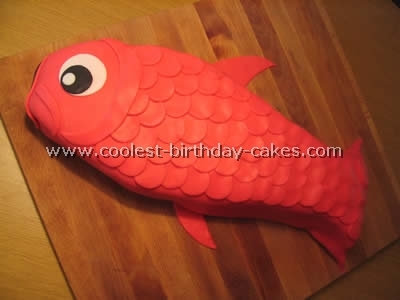 I found the cake idea for fish birthday cakes from brightideas.com and changed a few parts. 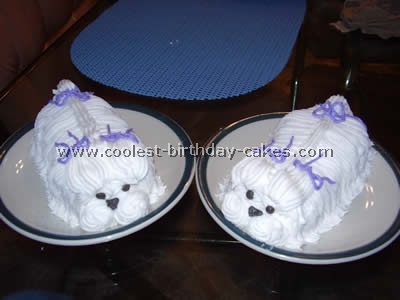 They have a printable template to use but I also found using four eggs and one box of pudding mix in the cake made it firmer and easier to cut. It took one boxed cake mix, two pre made containers or frosting that I dyed yellow and one large bag of M&M’s. I separated the M&M’s in colors and had more than enough. I did a crumb coat of frosting, first one thin layer of frosting and let it set in the refrigerator then did the top frosting layer. I used a fork to make the marks on the fins. I made a color pattern with the M&M’s using mostly blue. My daughter’s third birthday fish cake was my first fun-shaped cake. I made a 13×9 cake and cut the corners off using the pieces for the fins. I had to cut a piece off the top fin before frosting for a dairy-allergic guest. It’s frosted with whipped cream. One pint was the perfect amount and I had to whip it for a very long time to make it really stiff. I dyed it light pink which is hard to see here. The cake itself was made using a yellow cake mix and a can of strawberry soda nothing else because my daughter can’t eat eggs. I think I used about six smallish strawberries for the scales and mouth and a grape for the eye. Lay the scales beginning at the tail and work toward the head. I ran the frosting knife through the whipped cream for lines in the fins. 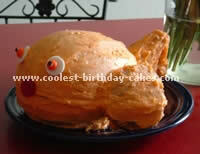 This is a fish cake that my Mother and I made for my son’s 1st birthday. 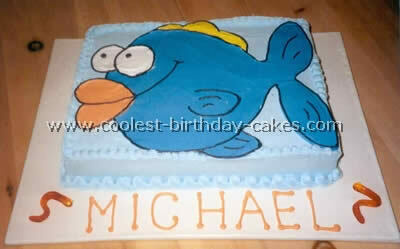 We were expecting a lot of guest hence all the fish birthday cakes! I wanted to do a beachy/pool theme for his birthday since it falls in the middle of the blazing summer! We used one large cake pan for this. We used a basic box cake mix. We first cut the oval for the body shape. We then attached the remaining corner pieces (the fins) with toothpicks. We used a buttercream frosting (canned) to ice the cake. We added food coloring to get the color we wanted for each cake. I matched the color of the frosting to the color of the candy. For the yellow cake we used chewy sweet tarts. You can use whatever kind of candy you like. The eyes were made of a partial marshmallow and brown M&M’s. The lips were two red Dum-Dum suckers. To add more detail to the cake we used the tip of a fork to add dimension to the tail. 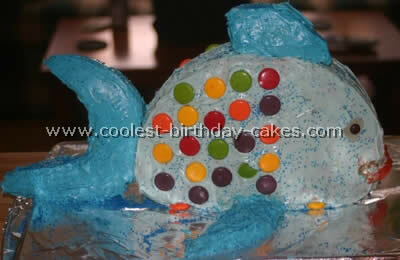 These fish birthday cakes were a huge hit! The design is easy, it’s putting the candy on that takes the time! 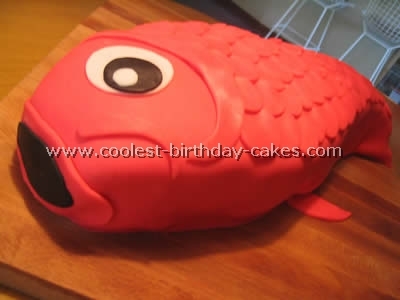 This cake I actually found on this website for fish birthday cakes. There was a link to the recipe found on www.birthdayexpress.com. 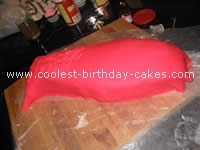 It turned out to be a really cool cake but working with the tail proved to be a challenge. I had to use a LOT of wooden skewers to hold the tail in place. Try to make the layers rather thick. If I had done that this recipe would have been perfect. 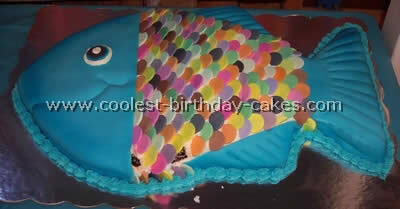 I made 2 round fish birthday cakes and trimmed them to make the fins. I used wooden skewers to attach the fins. I used mock cream/butter icing for the frosting colored blue. I used smarties for the scales and red licorice for the lips. These were secured with toothpicks. It was time consuming and I suggest drawing a stencil as a guide for the fins. I used a "dolphin" shaped cake pan and cut off the dolphin’s snout after baking the cake. I then mixed food colorings to get brown grayish-green and other fish-like colors. I decorated with shiny sugar "cake decorating" crystals. 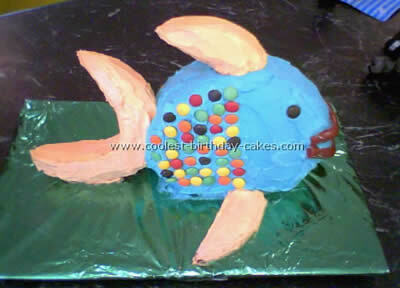 The cake was for my husband’s birthday, he loves to fish so I thought it would be a cute idea to make fish birthday cakes. 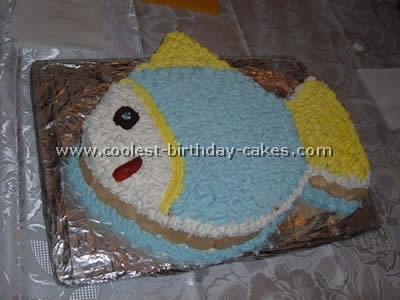 For a 19th birthday for a girl who LOVES fish we made 3D fish birthday cakes using a medium sized egg mold and a small rectangular pan. The egg halves were frosted together and the fins were cut out of the rectangular piece to be held in place with two toothpicks each. 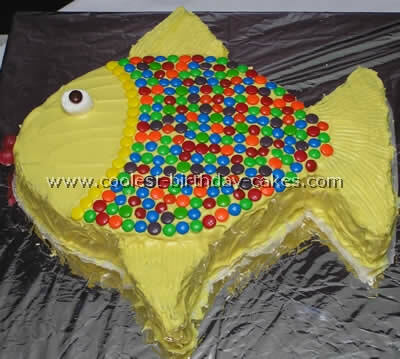 A simple butter cream frosting was used to frost the fish with necco wafer skittle and mini chocolate chip eyes. The mouth was a gummy lifesaver. This would be great with colored powder sugar or glaze instead of a frosting. The frosting is very sweet with the Chocolate Intrigue cake. This was my first grandson, Michael, first birthday cake. They had a fish theme so I made fish birthday cakes, with a hot dog party and swimming in the backyard. They were given their birthday treats, bucket with a shovel. It was an 11” x 17” cake pan and it takes 2 cake mixes for this size pan. I prefer Duncan Hines cake mixes and always sit the oven temperature at 315 degrees so that the cake center will rise flat and even with the sides. I also put wax paper back into the original pan and cover very well and freeze the cakes. They are easier to ice if frozen. I used the invitation and found a cute fish that I thought I could do and would be colorful. I traced it with a toothpick onto the iced cake. 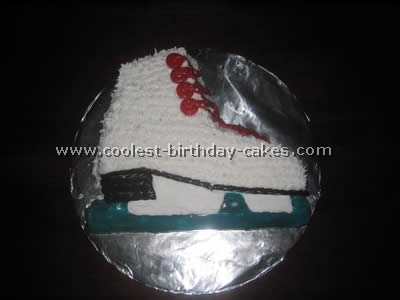 Since the area was large I iced all the areas of the fish and smoothed out the icing. I came back with black #3 round tips and added all the details. The top and bottom were shell borders. I added his name and put gummy worms on the board. We all had a good time at the party. 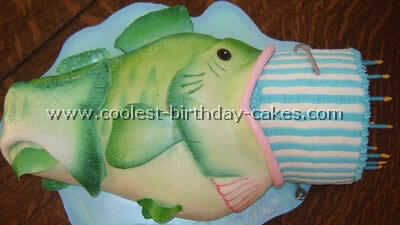 For our fish birthday cakes I used a plain chocolate sponge cake with some jam in the middle (if desired). 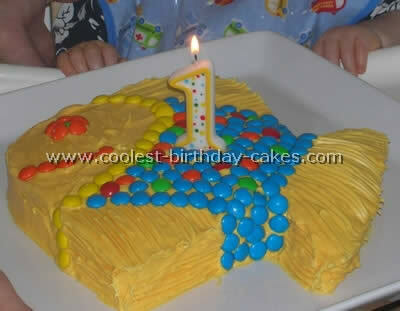 I decorated it with whipping cream, colored yellow and blue with food coloring. I used ice cream wafers cut with a small round cutter. For my daughter’s 7th birthday she wanted a Koi themed party. Luckily she has a summer birthday and we have a pool. Once we decided on the theme we planned a trip to NYC to one of our favorite stores: Pearl River in Soho. We purchased Koi windsocks for each guest as a goody bag tied the end and filled it with different Japanese candies and a set of chopsticks for fun. On the way home from New York I sketched out the plan for the Koi cake. 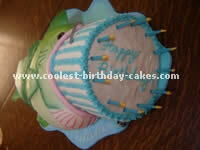 We used about 3 sheet cakes sculpted the shape of the cake with a knife lots of white icing and fondant icing. She was okay with cutting the cake although it was filled with strawberry cake, which is not her favorite. I made chocolate cupcakes with pink icing, red Swedish fish, and a tiki drink umbrella. I tried to make all of the food either red (tomato pie, m&m’s) pink or Asian. All paper goods were plain pink and the table linens were a red marimekko print. The children swam hula-hooped and had a great time especially my daughter.